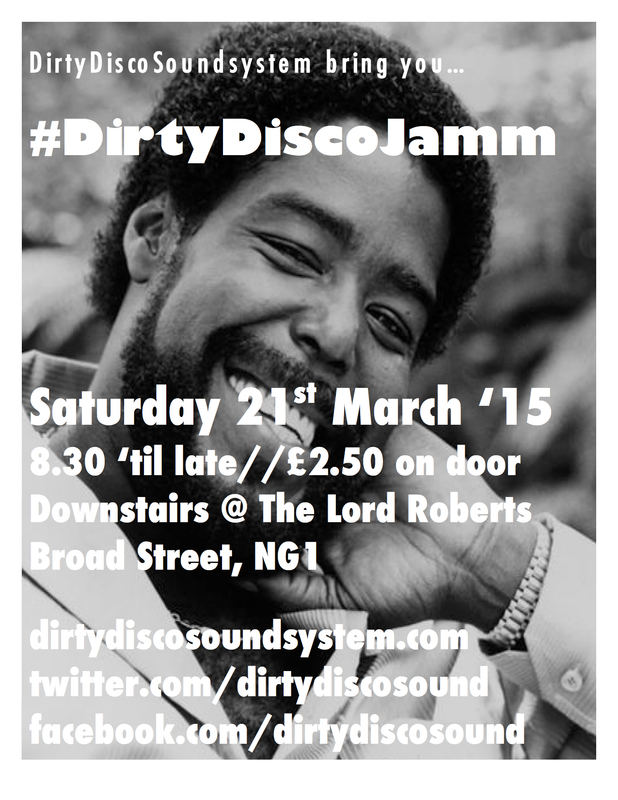 Not long now ’til our next DirtyDiscoJamm party in NG1, people. Some of you have asked again “So, what’s it all about?”. Quick answer is we just wanna give people a fun night out. That’s it. We know plenty of you are up for some booze and a boogie but don’t fancy the mess that’s some parts of town on a weekend – we don’t. So we’re having a stab at giving you and us that night out. The timings are babysitter-friendly if you got little ‘uns while The Lord Roberts’ good for cabs ’n buses (and dodgy post-party nibbles!). And thanks for all your support. Some people have been with us since day one way back and it’s much appreciated. 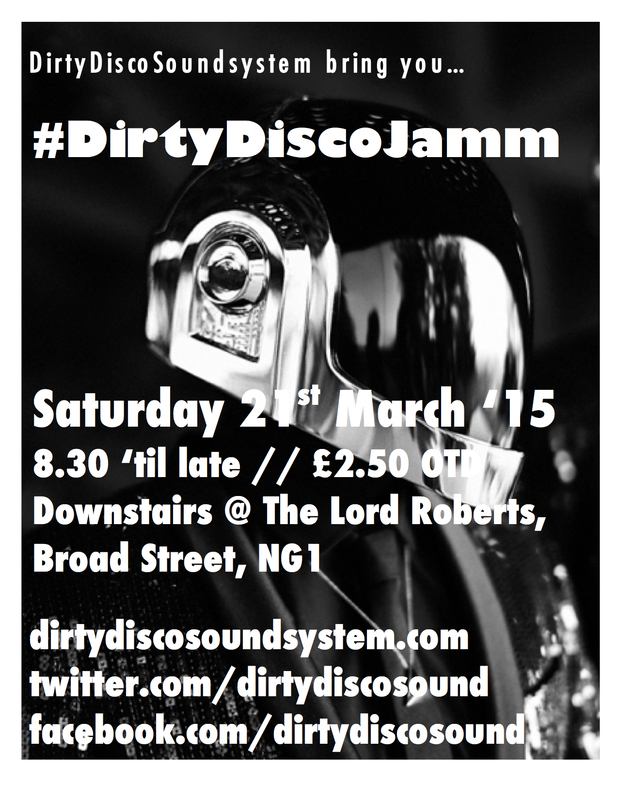 Sorry, it took a wee bit longer than we wanted but we’ve bagged our next DirtyDiscoJamm party night. Chuffed to say we’ll be back spinning choice cuts on Saturday 21st March downstairs at The Lord Roberts, Broad Street, NG1. Usual time – 8pm ’till late. Door tax is just £2.50. Bargain. 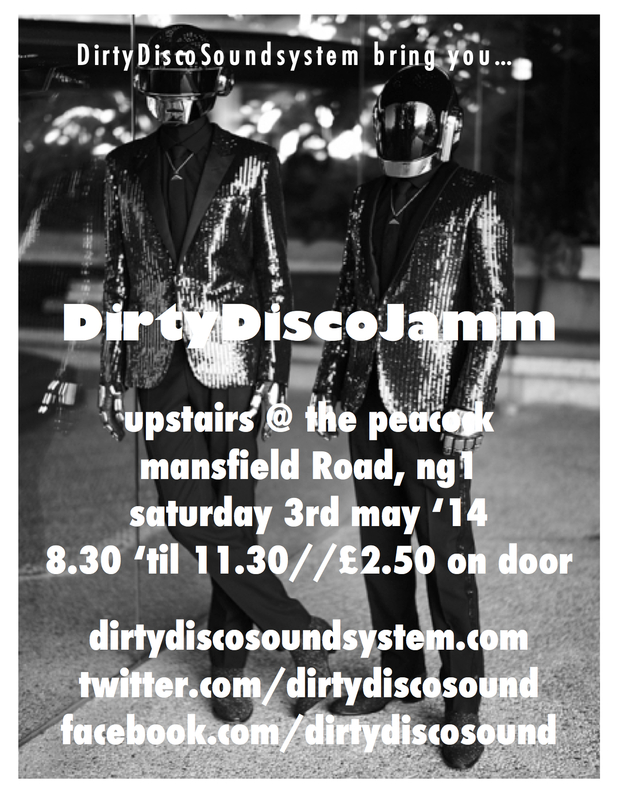 We’re super excited to say our next DirtyDiscoJamm party’s on Saturday 3rd May ’14. Same place – upstairs at The Peacock, Mansfield Road NG1. Same time – 8.30pm ’til 11.30pm-ish. Same great vibes, lovely people and lots of boogie. It’s bank holiday weekend too. So there’s no excuse not to get to stuck in that night. See y’all there. Can’t wait ’til then? Treat yourselves to our latest mixtape. Go on.